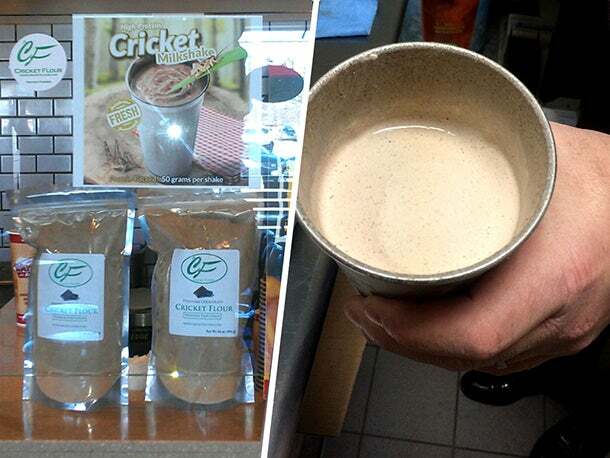 Milkshakes made with crickets on April 1 sounds like an April Fool’s Day prank. But, at Wayback Burgers, this joke turned into a real frozen treat. When Wayback Burgers’ marketing team decided to release fake promotional advertising for a “High-Protein Cricket Milkshake,” they had no idea how the concept would take off. Wayback Burgers -- a fast-casual burger chain with more than 100 locations -- first posted about the Cricket Milkshake on Twitter and Facebook on March 27. Quickly, it became clear that the response far exceeded the marketing team’s expectations. Customers enthusiastically contacted the chain, trying to figure out if the shake was real. Different cricket flour companies began tweeting at Wayback. Caught off-guard, the burger chain decided the only thing to do was to try and make the product and see what happened. Oregon-based Cricket Flours provided the crickets, which the burger chain mixed into chocolate, peanut butter and plain cricket shakes. The cricket flour adds around seven grams of protein while just 54 calories. The chocolate and peanut butter shakes contain two tablespoons of flavored cricket flour, or the equivalent of 96 crickets, while the pure cricket flavor contains a whopping 140 crickets. But don’t worry -- there won’t be little legs swimming around in your milkshake. “I was expecting to get actual cricket bodies, but it’s a powder,” says Gillian Maffeo, Wayback’s director of marketing. Realizing that the prank had yielded a surprisingly tasty milkshake, the burger chain decided that on April Fool’s Day, an East Meadow, N.Y., location would sell the shake as a limited-time offering. Then customers began calling the restaurant to ask if the shake was real, before showing up to try the beverage themselves. The shake was especially popular among millennials and fitness enthusiasts -- a demographic it is trying to reach, Maffeo says. Related: Can Fast Food Be Healthy? One Franchise Is Proving the Point and Profiting. Now the chain is working with its corporate chefs to fine-tune the hastily concocted milkshake recipe, Maffeo says. Customers can expect to see a wider release of the protein-heavy Cricket Milkshake around Wayback’s Free Shake Day on June 21. The Cricket Milkshake falls within the growing wave of business betting on Americans developing a taste for insects. Companies like Exo (cricket protein bars), Bitty (cricket-flour baked goods) and Chapul (cricket energy bars) believe that insects, specifically crickets, are the next protein-heavy “it” food. Last October, Greg Sewitz, the co-CEO of Exo, told Entrepreneur he believed that within six to 12 months, most food and health industry insiders would have tried or at least heard of products made with insect protein. In fact, it only took six months from his prediction for a fast-casual burger chain to launch a Cricket Milkshake. Who knows -- maybe the next step in McDonald’s reputation makeover will include launching a McCricket burger.